Tags are a great way to easily locate specific transactions whenever you need. 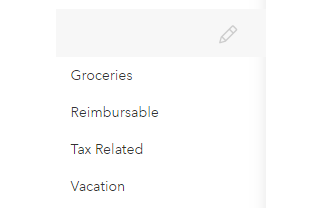 For example, we already have a "tax related" tag that will allow you to mark all your tax related transactions. You can create a new custom tag by clicking on Edit details of a specific transaction and then clicking Edit tags. For more info on adding custom tags, click here. Want to see only the transactions you tagged? Simply click the link for the tag you want to view in the lower left hand corner of the transactions screen and all your tagged transactions will appear!